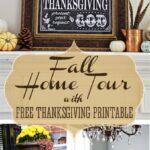 Welcome to my little fall home tour. 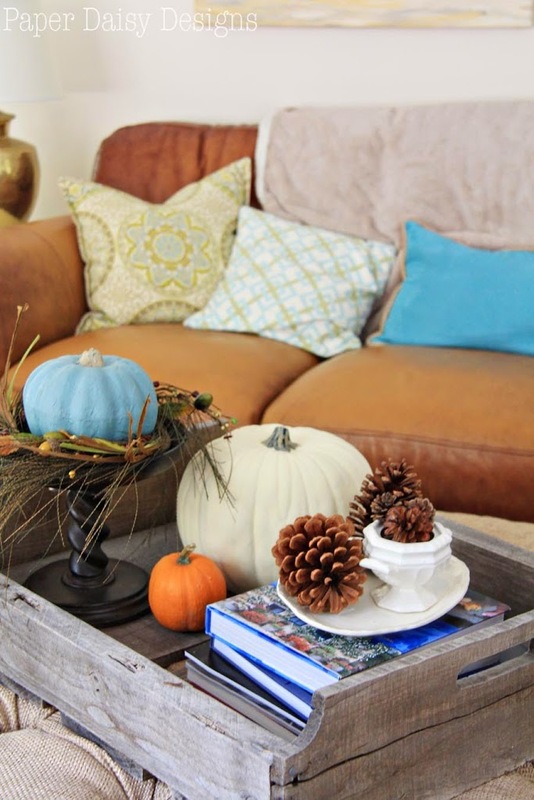 Maybe it’s more a collection of fall vignettes than a home tour, but after I got my Thanksgiving mantle finished, I realized the other little bits of fall around the house that were worthy of sharing. I totally subscribe to the notion that your home is meant to be shared with family and friends alike. And that means you! 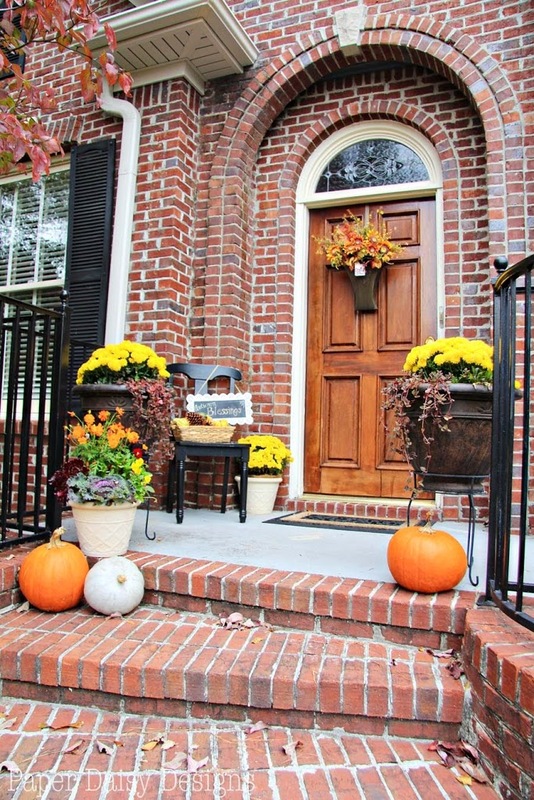 I had to rethink my front entry decorating because this house has no covered porch. But what it lacks in overhang it makes up for in steps! I can see myself really letting loose one year lining the several dozen steps with pumpkins and mums! 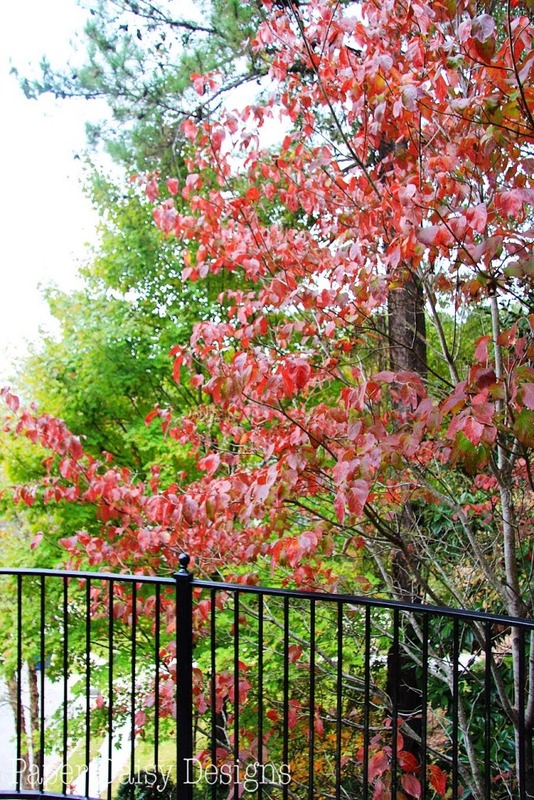 Having recently moved to our home in Alabama, you can imagine I was thrilled to discover that we still get to admire little bits of fall color here in the south. 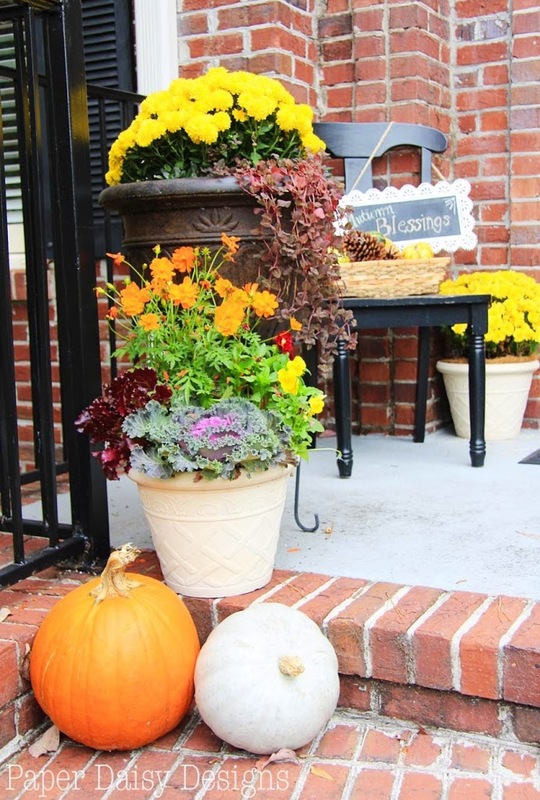 I love the traditional look of mums and pumpkins. To me, it’s not fall until they both make an appearance. For variety, I also added a pot of red lettuce, cabbage, pansies and violas. They should provide a bright spot all winter long. Let’s move inside now. 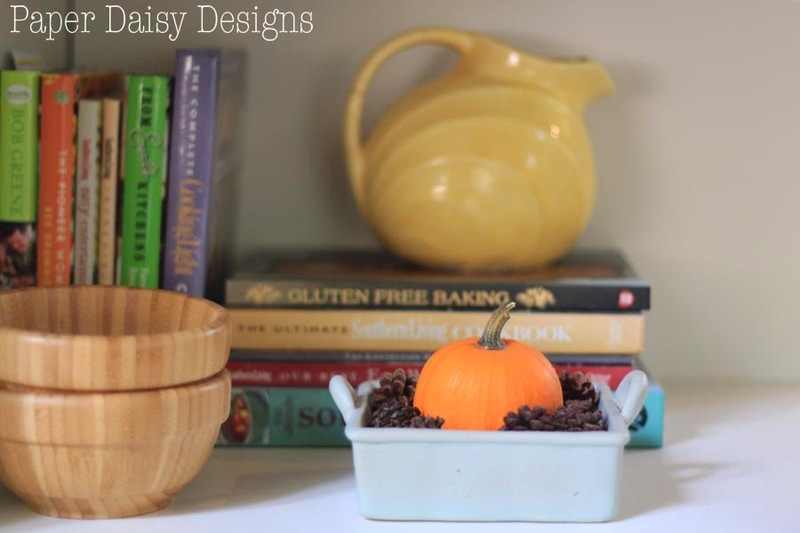 Simple touches like ceramic pumpkins and preserved leaves greet you, speaking to the season without being overly decorated. 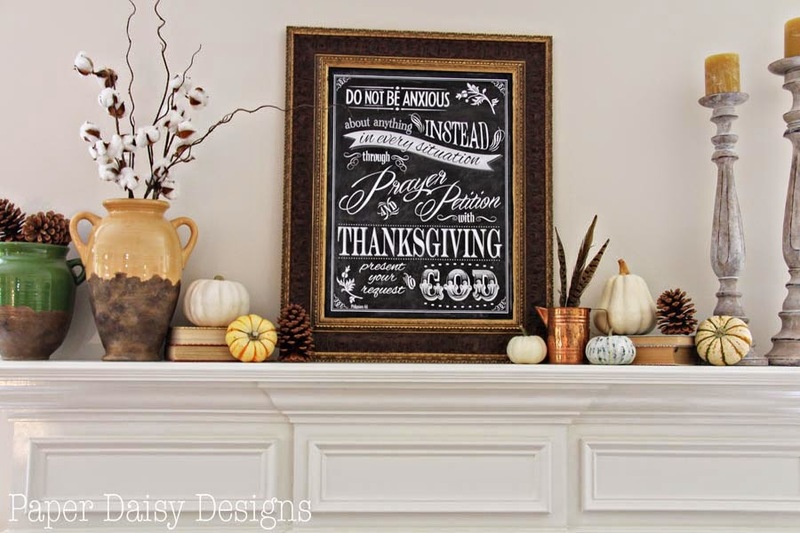 And here’s a look into the living room mantle with the Thanksgiving chalkboard printable. 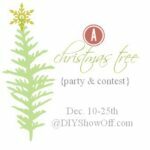 Scroll down to the bottom for the links! 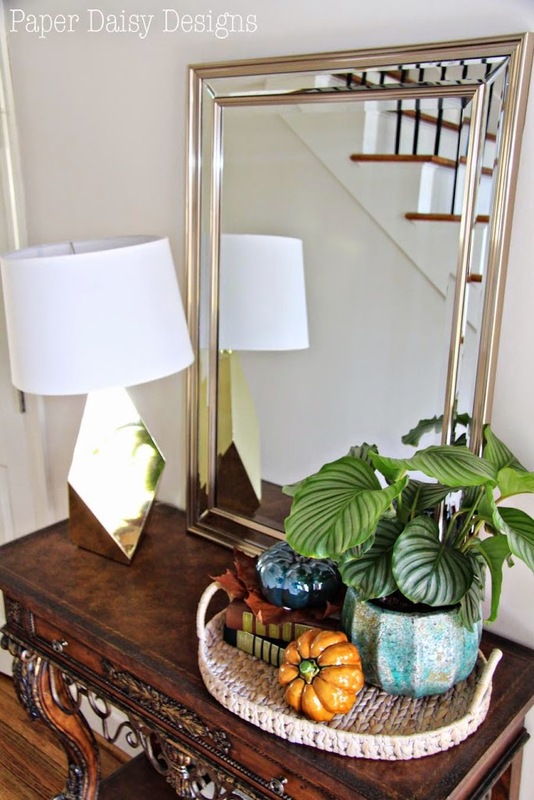 I picked up the cotton bunches at The Chapel Market a few weeks ago and some plopped some feathers into copper pitcher I found at a garage sale. 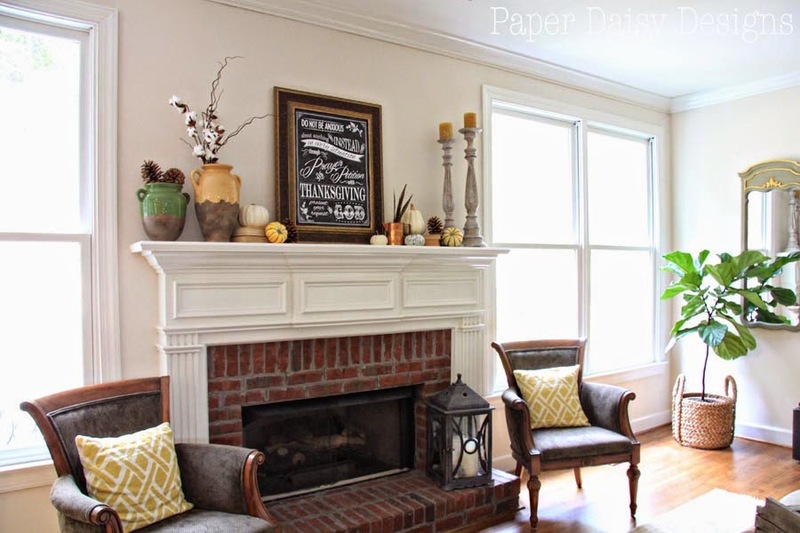 They add a warm, yet trendy touch to the mantle scape. Because I haven’t shared many photos of the living room, here’s a wider shot. 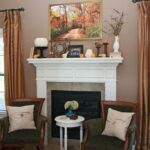 The back of our property is mostly one large slope that leads up to a wooded area, so we get to enjoy the full view of our newly landscaped rocky hillside without the need for privacy or drapes. 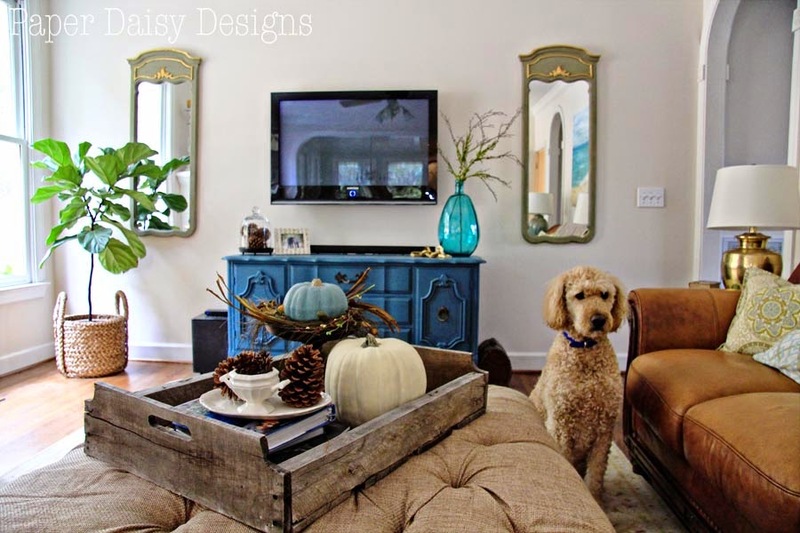 Moving around the room, you’ll see my resident photobomber, Tucker. 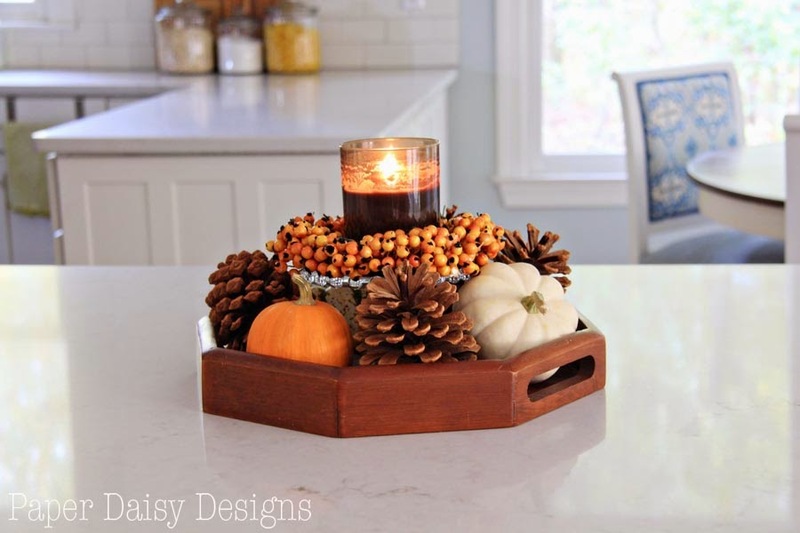 Reappearing this fall, is the tray I built from a pallet a few years ago filled with more pumpkins, some painted some real, and a little platter of pine cones. 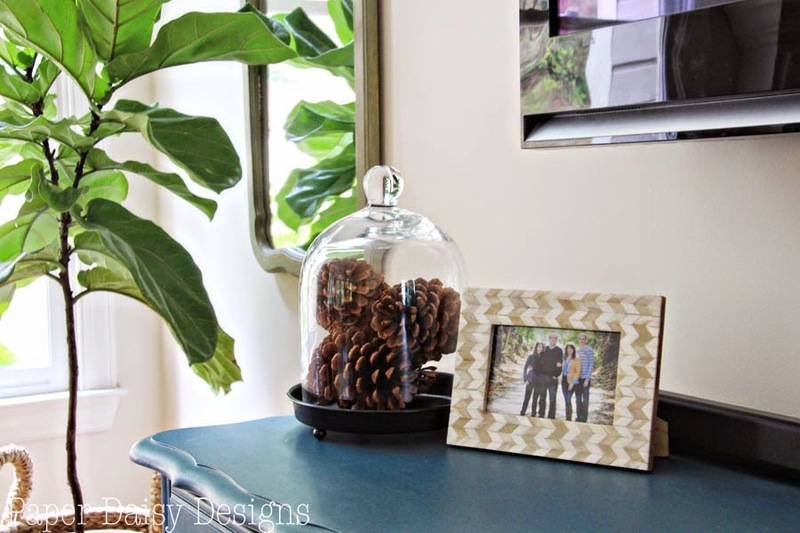 On the buffet that serves as a TV console is a cloche piled high with pine cones and nestled next to my favorite fall family photo. My friend gathered all the pine cones I’ve used around the house on one of her morning walks. I’ve never collected such perfect pine cones. What a treasure! In the kitchen, I’ve added just a few sprinkles of pumpkin spice. I know I haven’t formally revealed the kitchen yet, but here’s another little peek. If you’ve been around for a while you’ll notice my newly reupholstered and painted chairs I’ve mentioned on my to do list. Back to the dinning room. I was blessed to be given some dried oak leaf hydrangea flowers from the ladies who bring flowers for the church. In all my gardening expeditions recently, I learned that oak leaf hydrangeas are the state wildflower. My love for hydrangeas runs pretty deep, so you know I found a place for at least one in the backyard. One of my favorite finds is this old tool tote I found on a antiquing trip when we lived in Missouri. 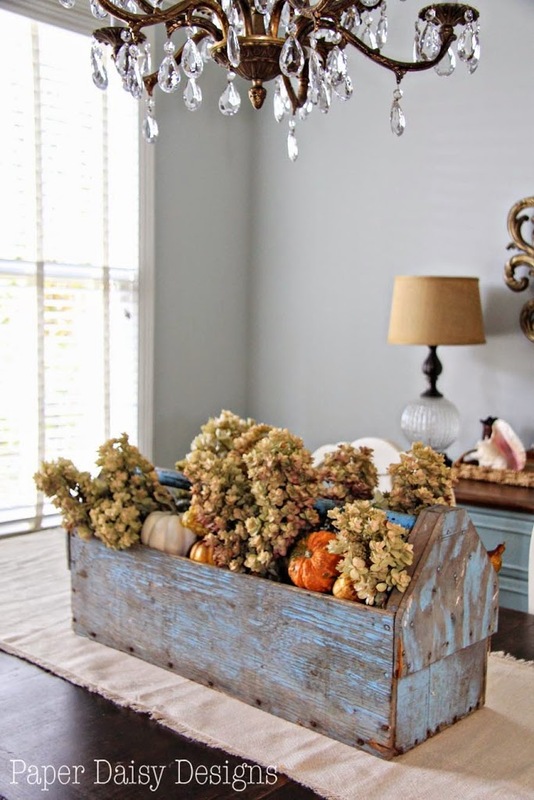 The chippy blue paint is the perfect compliment to the warm tones of the dried hydrangeas. Here’s another look at the mantle and the links for the tutorial and downloads are below. The printable is available for download in three different sizes. Large format printable 18×24, 16×20 or standard print of 8×10. 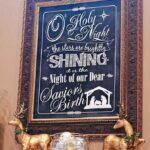 There is a little bit of a tutorial necessary for printing this large graphic for under $2, so please click the link below. 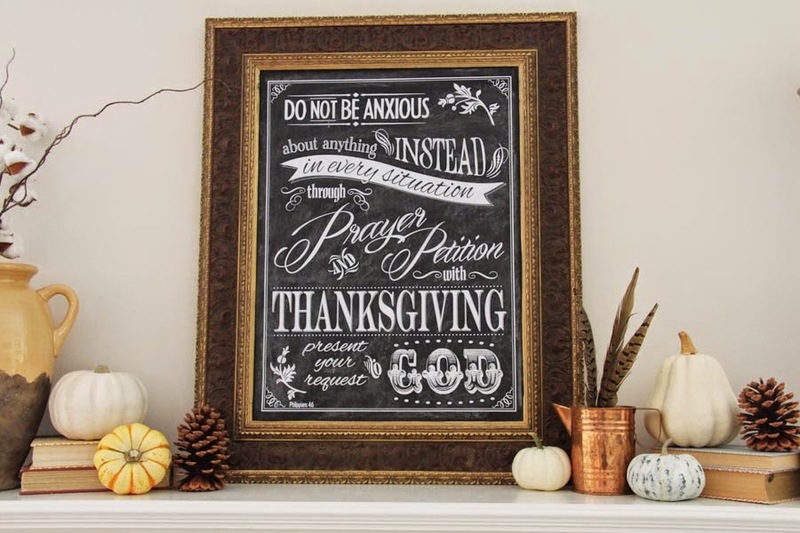 Thanksgiving Chalkboard featuring Philippians 4:6. Thank you for touring my fall home. I hope to see you again real soon! Enjoy the printable. Found these printables on you page and sent them to a printing company to be printed..before I did that , it asked me to install DROPBOX. No big deal. So I installed Dropbox, and sent the three sizes to Dropbox, I then emailed to the printing shop nearby. When they came out, both the 18×24, and the 16×20, were like grayscale, and had little squares around all the writing. You could also see the graph paper behind the printable. Any idea why that could have happened. Still learning about all this, but thank you so much for putting the printables on your Pinterest board. 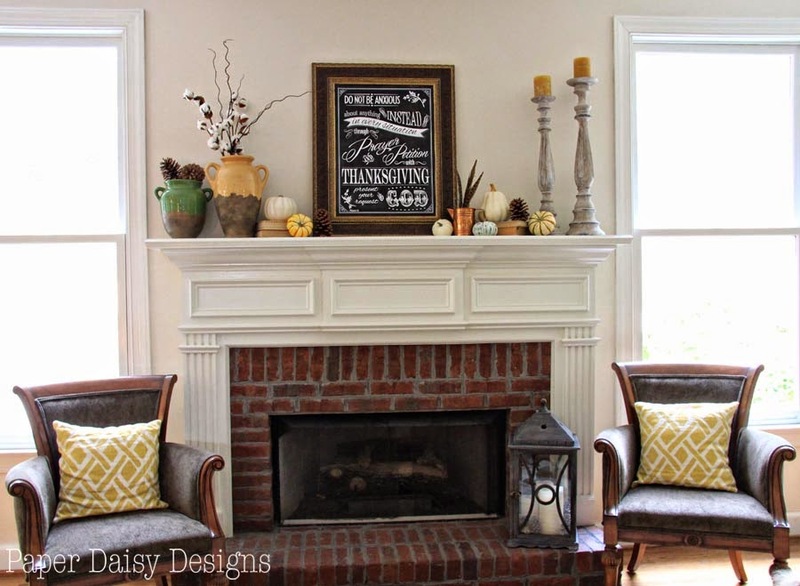 It was the thanksgiving chalkboard print. Appreciate any advice I can send to the printing company, so I can get this awesome print on my wall at church! Karen, I can only really comment on the Staples type printers as I have used them on several occasions and different locations. It is very hard to know how each and every printer will react. My best advise is to have them review the file and have them make a suggestion. Maybe they printed it on graph paper? I’m so glad you like the print and hope you were able to get it to work for you and your church.